Whether you have a lake view, a mountain view, a golf course view, or a forest view, you will probably want lots of big windows so that you can enjoy the view. This makes windows a very significant part of the house's cost. We already discussed several considerations regarding choosing windows in the chapter on "Choosing A Builder". (See "Name-Brand Windows".) So this section is just a brief look at construction considerations. Update 2008: Also see this section for more information about window specifications. We wanted to be able to open some windows for ventilation, but every window which can open needs a screen on it. 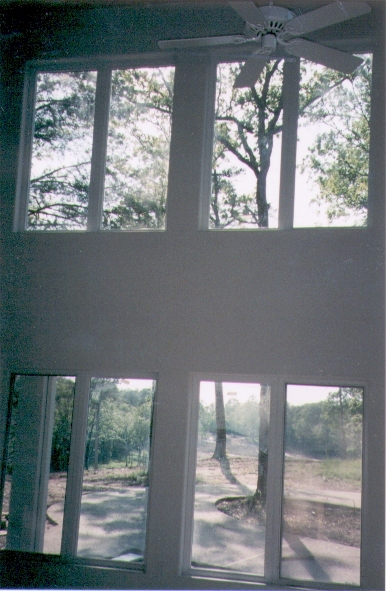 Screens degrade the view somewhat, so we specified only enough windows to open to provide some air flow. On the other hand, screens mount inside and can be removed in a flash during the too-hot and too-cold months when you won't have the windows open anyway. You will see that most of the chapter on Dealing With Mistakes, has to do with windows. As explained there, these were not really mistakes as much as not being able to visualize in advance the impact of windows. 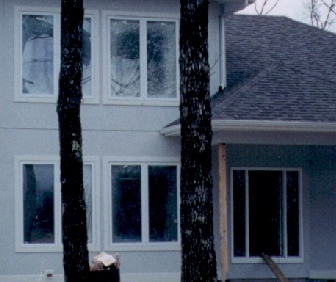 While the builder's drawings of the outside of the house made the windows in the den (with its 20' ceilings) look large, when the walls went up and the windows went in, we were disappointed with how much wall space there was between the lower and upper windows. I guess we were expecting glass walls. Craft told us that the owner of the house whose high-ceiling den inspired our own had the same reaction when his windows went in. He had the windows taken out and larger windows ordered. This was extremely costly, both because of the cost of the windows which were removed and because the oversized windows which took their place are very expensive to start with, since they require tempered glass. Even if we had wanted to spend the money, we could not have made the change since the roof line coming from the front porch comes across the front of the den wall between the upper and lower windows. Craft assured us that we have plenty of window space in that room and in fact, I think we have already gotten used to it. We even warned a friend prior to her windows going in that her first reaction to only being able to see through the glass (as opposed to having the open studs in place) would be that she had lost too much of the view, but that she should not panic. Sure enough, the windows/doors went in and she had them replaced for "more glass". The moral is that if you have a view, specify the largest windows that you think you can possibly afford at the outset, or prepare to be disappointed (at least temporarily) when the windows go in. If you get windows which open with cranks -- the location of the latches matters. Usually two or more windows will come from the factory in one frame. The cranks are located at the bottom and the window latches are locate on the sides. With two windows in a frame, make sure that the latches are on the sides closest to the other window, not on the sides next to the outer edge of the window frame. Most of our windows came with the latches near the outer edges of the frame where they scrape the wall every time they are used. If the latches were on the sides of the window in the middle of the pair of windows, there would not be a problem. In our last house, we did not clean the outside of the windows as often as we should have and the glass eventually became etched with water spots. With a clear view of our surroundings being so important here, we were determined not to let that happen again, so we schedule a couple of hours at the start of each month to wash windows. With the right equipment, even cleaning the high windows isn't that hard. From Lowes, we got two poles which extend to 16'. We got a cloth window washing attachment for one pole and a squeegee attachment for the other. You could do it with one pole, but you would have to keep switching the two attachments. Lowe's also has a window cleaning liquid that you mix with water, rub on with the cleaning attachment and squeegee off. Early in the morning during Summer months lets you stay cool while working and more importantly, it means that the window glass will not be too hot. Windex makes a cleaning liquid whose bottle is attached to your hose and squirted onto windows. They claim you don't even have to squeegee it off. However, it does not really get windows as clean as using a cloth and squeegee. Also, you will have dirt and chemicals running down the side of your house and onto your bushes. But if you have vinyl siding and no bushes below the windows, you may want to try the Windex cleaner. Mini-blinds, vertical blinds, honeycomb/pleated shades -- these were the window covering options we had to choose among. We decided on pleated shades primarily for reasons of personal taste. The next decision was whether to have shades which stack at the bottom and pull up, or stack at the top and drop down. In the den (with the pool table), we used shades which stack at the bottom and pull up. We want to be able to pull the shades up high enough to protect the sofa (which is next to the window) from fading, but to still be able to see out of the top half of the window. In the living room, where we watch TV, the shades will only be closed when we are watching TV during the day and want to cut out the glare. The rest of the time they will be open. Since we do not anticipate them ever being partially open, it does not matter if they stack at the bottom and pull up or stack at the top and pull down. Since those that stack at the bottom have strings going up the middle of the window, we opted for the top-stacking shades. The living room shades are also opaque in order to completely block out the light when watching TV. The non-opaque shades let some light filter through, but are supposed to screen out the U.V. When deciding what kind of window frames to have, be sure to take into consideration the kind of window coverings you will want, if any. It may even be a good idea to consult with the window covering specialists before building. Our window covering consultant told us some sad stories about people who have spent a lot of money on special window shapes or elaborate window frames, only to lose the entire effect when they had to put window coverings over them which had not been planned for in advance. Some builders don't even leave room to mount the window coverings inside the frame. 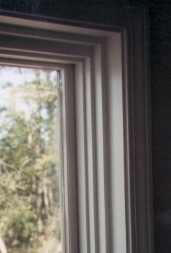 The multiple layers of wood inside the frame look nice, and if you are going to have drapes mounted on the wall outside the window frame, this type of framing is not a problem. But if you are planning on blinds or pleated shades mounted inside the frame, it would be difficult to do with the type of frame shown at left. So be sure that your builder knows what your window covering plans are. Another problem can be the hardware on windows with cranks. The shades may not be able to stack at the bottom if a big window crank is in the way. Craft gave us the name of a supplier in Hot Springs (Horner's) to go to for a front door. We did not see anything we liked, so Craft gave us all the front door catalogs he had on hand, but we still didn't find anything. A friend gave us a catalog in which we found a door that had a contemporary look we liked, but we were not too happy about ordering a door without being able to see it first, but we didn't have any choice if we wanted that door. The first time I saw it leaning against the wall in the garage, I thought "Omigod, what have we done?". But when it was installed, I really liked the way it looked. Once again the moral is that if you have a negative reaction the first time you see some element of your new house, give it a chance before you change it. 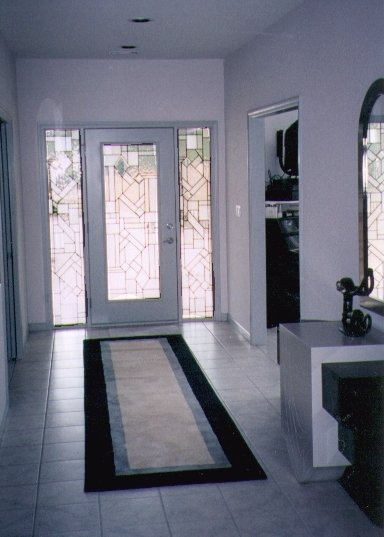 Inside the house, we used a lot of pocket doors. 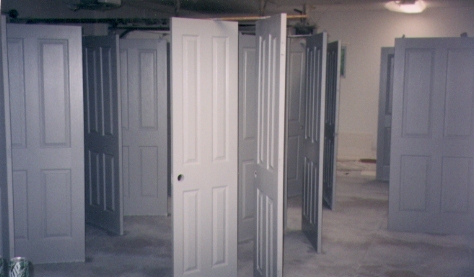 They don't get in the way when opened and Craft said that they don't cost any more than regular doors. The drawback to pocket doors is that light switches cannot be put on the wall where the door goes in. In fact, you even have to be careful hanging pictures, towel rods, etc., in the same wall area. For some reason, the only pocket door on which Craft put a lock was between the master closet and the utility room. The pocket doors into one guest bedroom and into the living room (where guests might sleep on a sofa-bed) and into the master bath do not latch. If you want them to latch, be sure to specify it. If you have a latching pocket door, the door should close into a recessed area in the door frame instead of just butting up against the frame. This way there is no space between the door and the frame for someone to see through. Again, you have to specify this to make sure you get it. If you have exterior doors with glass in them, you should get double-cylinder locks on them. Otherwise, someone can break the glass and unlock the door. Since our basic house color is gray, we did not want brass hardware on the doors. It is not enough to order handles of brushed chrome (or whatever). If you do not specify the same for hinges, etc., the builder will almost surely use brass hardware, and you will have to pay extra to get them changed out. We had specified brushed chrome, so although the doors were originally installed with brass hinges, Craft changed them to chrome at some point. Judy is using brushed nickel in her house, but was concerned when selecting her kitchen faucets that they may not match up well with the stainless steel sink she wanted.